Experience pre-1840s frontier life at the 2019 Texas Free Trappers Rendezvous on February 22-24, 2019 at the site of a previous Southwestern Regional Rendezvous in Shiner, Texas. NOTE: Normally this date would have been February 8-9, but has been moved due to weather concerns. Pre-1840s period camping is stressed; however, modern camping is allowed in an adjacent area. Buckskinning rules apply; period dress required at all times while in camp. If you are a pilgrim and want to know more about rendezvous, you are not required to wear period clothing, but wear clothing suitable for the woods, no baseball caps please. Of course if you already have some period clothing, you are on your way! Each competitive event will hae a re-entry possible for $2.00. RSVP Booshway or Segundo that you will be attending. Entry into site is controlled and you must call Booshway or Segundo upon arrival so they can open the gate. Call before leaving home if there is threatening weather to confirm. No additional fee for traders. Period or related items only. The ranch gate opens at 1:00 pm on Thursday for early arrivals. There will be Texas Free Trappers Rendezvous signs posted along the roads, so keep your eyes peeled. 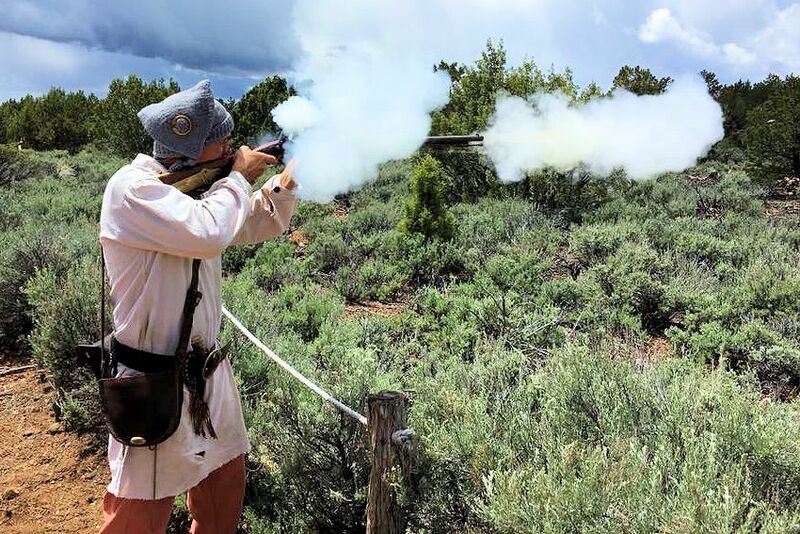 Events such as a Rifle Shoot, Primitive Archery, Hawk & Knife Throwing, and “Get Acquainted” Campfire. There will be a community pot luck supper on Saturday evening (5:30ish). Please plan on having something of a main dish, vegetables or a dessert will be welcomed and so far we have never had anyone go away hungry! Other activities include: Council Fire, Awards, News and announcements, Period Tales, “Round Robin” trading session – if you have “priceless” items you’ll part with. Break camp and clean up site before heading home. Prizes are given for each event, but you must be a member to compete. Blanket prize donations are requested and appreciated and should be in keeping with pre 1840s period. We are asking for volunteers to help run events. Contact the Booshway for more details. Firewood is available on site for collecting, but you may bring your own. BRING WATER as no potable water is available on site. The Texas Free Trappers Spring Rendezvouss will be held on a 200 acre site near Shiner, Texas at GPS coordinates: °29’10.2″N 97°16’12.1″W (29.486167, -97.270028). NOTE: The map link is to Shiner. Use directions below, and/or GPS coordinates to locate camp. Turn Left at Tee of CR 355 (there is no road sign there). Turn Left after about a mile into the gate with “TFT Rendezvous” . Follow the road to the left of the landowner’;s hunting camp to rendezvous camp area. Mark your calendar today so you don’t miss this year’s Texas Free Trappers Rendezvous in Shiner, Texas.